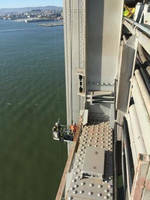 Seattle – Spider, a division of SafeWorks, LLC, hasbeen providing suspended access solutions throughout various construction and retrofitting phases of San Francisco’s Bay Bridge, most recently supplying the access, fall protection, and training solution for electrical work including low voltage upgrades and network service installations. Rosendin Electric turned to Spider when faced with the task of installing conduit on the western portion of the Bay Bridge. Spider supplied two 11-ft swing stages powered by SC1000 traction hoists, equipped with walk-thru stirrups, and customized with 110V transformers that provided a power source for the crew’s tools. These platforms were hoisted 250 ft above the rushing water by crane and expertly secured into position by Spider’s rigging team. Additionally, Spider provided a work basket to access one column’s interior, as well as horizontal lifelines and self-retracting lifelines for fall arrest protection. They also conducted customized Competent Person Training specific to the jobsite. Spider’s equipment is expected to be on site throughout the four month duration of the electrical project. Founded in 1947, Spider, a division of SafeWorks, created the powered suspended access business by introducing the wellknown Spider basket. Since then, our product and service offering has expanded greatly to serve the needs of an ever-growing marketplace. Spider is the largest manufacturer and distributor of access and safety solutions in North America, serving more customers from more locations with a wider variety of products and services than any other company. From baskets, traction hoist and platform rental, to safety and training, to specialty-engineered products - Spider has a strong team of professionals, along with a national network of sales, service andsupport capabilities to provide you with the most reliable access solutions available.